Prof S K Srivastava has obtained his MSc and PhD degree from IIT Kanpur (under the supervision of Padma Bhushan Prof S S Katiyar, FNA, FNASc, FTWAS; Former Vice-Chancellor, CSJM University, Kanpur & Former President, Association of Indian Universities). He joined the Department of Chemistry, Manipur University, in 1983 and served as Professor since 1995 till his appointment as Vice-Chancellor, NEHU on 24th September 2015. Prof. Srivastava’s field of specialization is Physical Chemistry, and the research areas include: Nanomaterials, Surfactants and their applications. He has done his post-doctoral research work at the University of Bristol, U.K and is a recipient of the Commonwealth Academic Staff Fellowship. Prof. Srivastava has been a Member of the first Academic Council of newly established Central University of Jharkhand, Ranchi (for three years term, 2009-2012). He was also a Member of the first Academic Council of Central University of Bihar, Patna (for three years term, 2009-2012). 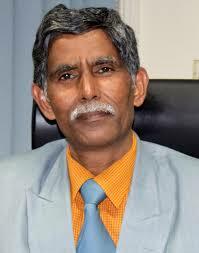 He has been associated with the Working Group on Nanotechnology, CUJ, Ranchi, and with the UGC Expert Committee. Prof Srivastava has been the Visitor’s Nominee (Central University), NAAC Peer Team Member, and also Subject Expert in Selection Committee for both Chemistry and Nanotechnology. He has also been awarded the Chemical Research Society of India (CRSI) Bronze Medal 2015 in recognition of contributions to research in Chemistry. Dalton Transactions, 2015, 44, 6457. Hybrid nanomaterial YVO4:Eu/Fe3O4 for optical imaging and hyperthermia in cancer cells. Journal of Materials Chemistry C, 2015, 3, 1965. Enhancement of luminescence in white emitting strontium fluoride core@ calcium fluoride shell nanoparticles. Nanoscale Research Letters, 2015 ,10, 347. Multifunctional hybrid nanomaterials from water dispersible CaF2:Eu3+, Mn2+ and Fe3O4 for luminescence and hyperthermia application. Journal of Physical Chemistry C, 2014,118, 18087. Luminescence and photocatalytic studies of Sm3+ ion doped SnO2 nanoparticles. New Journal of Chemistry, 2014, 38, 115. Dendrimer facilitated synthesis of multifunctional lanthanide based hybrid nanomaterials for biological applications. Journal of Materials Chemistry, 2012, 22, 3395. Quantitative analysis of dye decolourisation reactions in mixed micellar systems of sodium dodecyl sulfate with tween-20, tween-40 and triton X-100. Australian Journal of Chemistry, 2012, 65,153. Influence of nonionic surfactant on alkaline hydrolysis of methyl violet catalysed by cetyltrimethylammonium bromide. Journal of Dispersion Science and Technology, 2012, 33,1071. Preparation of white light emitting YVO4: Ln3+ and silica-coated YVO4: Ln3+ (Ln3+ = Eu3+, Dy3+, Tm3+) nanoparticles by CTAB/n-butanol/hexane/water microemulsion route: Energy transfer and site symmetry studies. Journal of Materials Chemistry, 2011, 21, 5326. Disappearance and recovery of luminescence in Bi3+, Eu3+codoped YPO4 nanoparticles due to the presence of water molecules up to 800°C. Journal of the American Chemical Society, 2011,133, 2998. Kinetic studies on sodium dodecyl sulfate micelle inhibited reactions of triphenylmethyl carbocations with cyanide ion. Reaction Kinetics, Mechanisms and Catalysis, 2011, 104, 17. Effects of Ce3+ codoping and annealing on phase transformation and luminescence of Eu3+ -doped YPO4 nanorods: D2O solvent effect. Journal of the American Chemical Society, 2010, 132, 2759. Surface chemistry of surfactant AOT-stabilized SnO2 nanoparticles and effect of temperature. Journal of Colloid and Interface Science,2010, 349, 27. NAAC Peer Team Visits to higher education institutions. International Symposium on Nanotechnology & Cancer Theranostics (ISNACT- 2015), 19-21 Feb. 2015, IIT Bombay; Delivered invited lecture entitled, “Luminescent magnetic nanohybrids for hyperthermia application in cancer therapy”. 17th CRSI National Symposium in Chemistry, 6-8 Feb.2015 CSIR-NCL, Pune; Delivered Chemical Research Society of India (CRSI) Bronze Medal 2015 Lecture.